^ NIGHT, DAY & (7 March 2016). "Ian McShane: Working-class actors must get more help". Express.co.uk. Retrieved 14 February 2018. ^ "Ian McShane". TVGuide.com. Retrieved 14 February 2018. 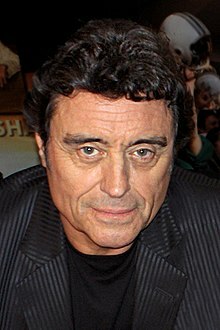 ^ "Filmography for Ian McShane". Turner Classic Movies. Retrieved 14 February 2018. ^ "The Homecoming @ Cort Theatre | Playbill". Playbill. Retrieved 10 June 2016. ^ Hale, Mike (22 July 2010). "Ian McShane in Starz Mini-Series of Ken Follett Book". The New York Times. ISSN 0362-4331. Retrieved 14 February 2018. ^ "'Deadwood' Movie Starts Filming with Majority of Cast Returning". The Hollywood Reporter. Retrieved 5 November 2018.